There are at least four species of snakes in the general area of my garden. The Diamond Python, Coastal Carpet Python, and Common Tree Snake – all of which are non-venomous. Then there is the Red-bellied Black – which is not. I see a Red-bellied Black from time to time sunning itself or wandering slowly through the garden, but as they are non-aggressive it doesn’t really bother me. Anyway, I always assumed they were just on their way to somewhere else. So a few mornings ago when I found a dead baby Red-bellied Black on the lawn I was a bit surprised. Now how do I handle this? 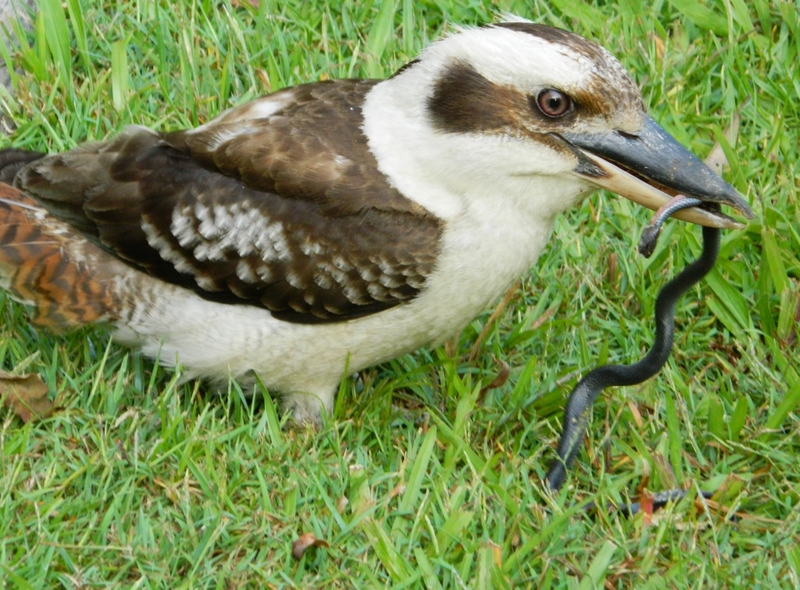 After throwing the baby snake around in the air a few times and trying to swallow it, the Kookaburra flew off with it into the trees. No doubt to bash it into manageable pieces. Now, the question is, was it dropped by a night-time bird of prey, or is there a little clutch of Red-bellied Black eggs somewhere in the garden ?? Previous At last … the elusive Catbird !